Cells are organic machines. Molecules are constantly being built, broken down, or transported. Every action takes a lot of energy. Where does this energy come from? The process of how a cell gets and uses energy is called cellular respiration. respiration = breathing in and out air. Brings oxygen into your lungs, then into your bloodstream. Main ideas: Why use ATP? Our bodies don’t directly use energy from our food. Sugars, fats and proteins all contain energy. 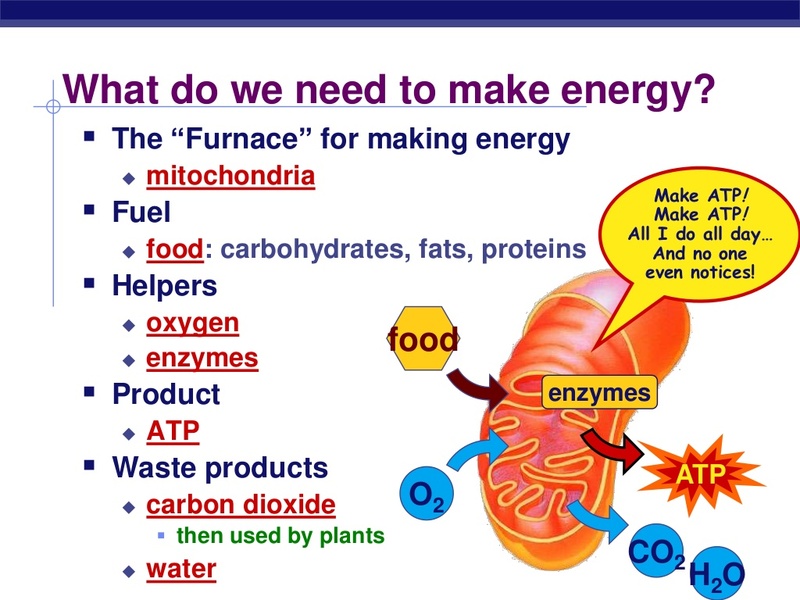 Yet inside our cells, each process use the ATP molecule – for energy. That’s why weird. Why does our body make these ATP molecules? Why not just directly use the sugars, fats or proteins? Imagine having a $1000 bill, and needing to buy soda, bread or a chocolate bar. They cost only a few bucks – and the $1000 bill you have is enormous. So we break the $1000 bill down into fifty $20 bills. So sugar is like a $1000 bill, and ATP is like a $20 bill. Ideally if you break a $1000 bill you should get fifty $20 bills. No money lost. If you ended up with than $1000, you’d have lower efficiency. But when we break down the energy in a sugar, if we add up all the ATP energy, we only have about 38% of that energy. Where did the rest go? No real-world-process is 100% efficient. Every process loses some energy as heat. In fact, that is one of the major laws of the universe – the laws of thermodynamics. A. Some of this waste heat is useful – it keeps our bodies at 98.6 degrees F, which is necessary for life. B. Hundreds of millions of years of animal evolution have adapted us to live within these conditions; it is expected and normal. As long as we get more calories each day, we’re fine. 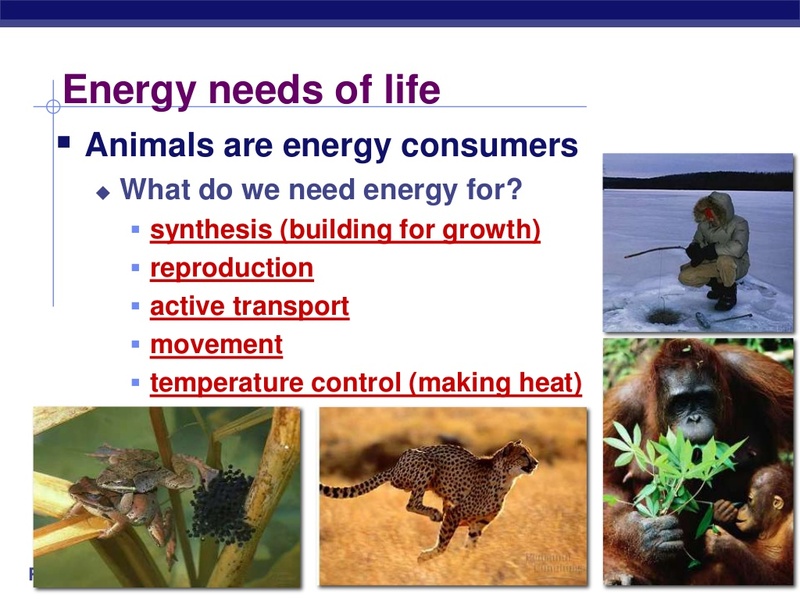 Slide 5: What do we need to make energy? 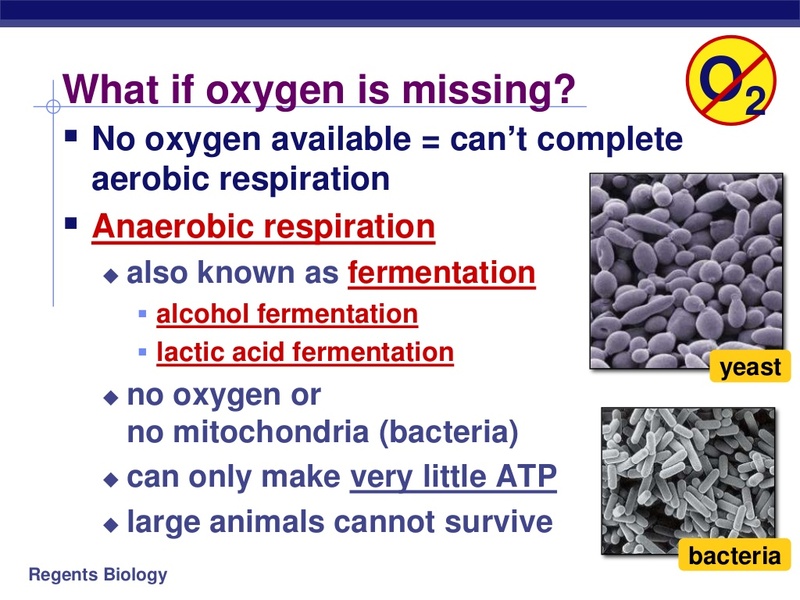 Slide 6: What happens if oxygen is missing? Feb 2016 MCAS: In cells, aerobic respiration (cellular respiration in the presence of oxygen) is more efficient than anaerobic respiration (cellular respiration in the absence of oxygen). 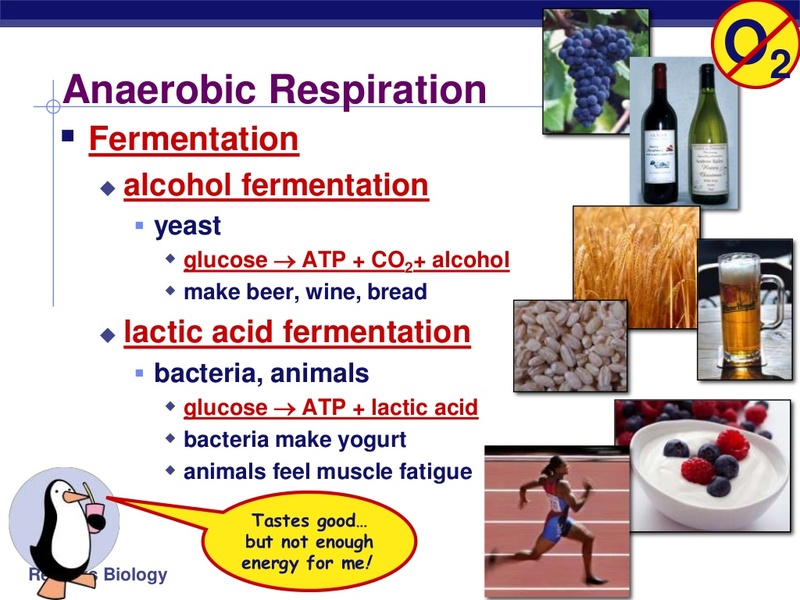 This is because aerobic respiration produces more of which of the following substances? 8.MS-LS1-7. Use informational text to describe that food molecules, including carbohydrates, proteins, and fats, are broken down and rearranged through chemical reactions forming new molecules that support cell growth and/or release of energy. bonds form, resulting in new compounds and a net transfer of energy.